Utterly recognizable and one of a kind, this creation extends beyond the cross itself. The Holy Rosary is magnified to complement the body’s silhouette, where the brilliant black beads form flowing shadows and the cross is beautifully illustrated and produces a shadow of its own. 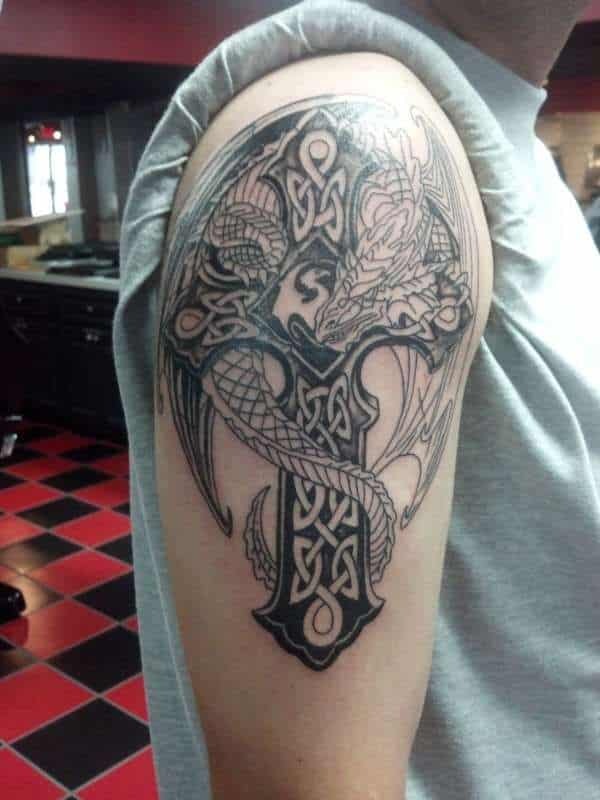 This Dragon tattoo design presents a cross ornate with finely depicted curves, loops and both thin and thick lines. Solid black dominates while a dragon rests on top, clinging on with its huge wings, sharp claws, and long, scaly body up to its tail. 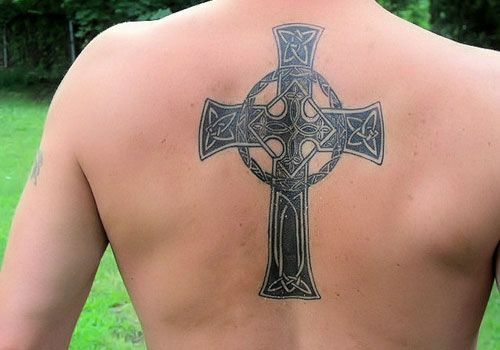 This men’s cross tattoo on back is enveloped in a circle around the intersection, symbolizing the sun, and exhibiting a diamond within it, this wide cross is adorned with carefully drawn knots looped and twisted, and made to overlap each other, to ultimately form the celtic cross design tattoo. 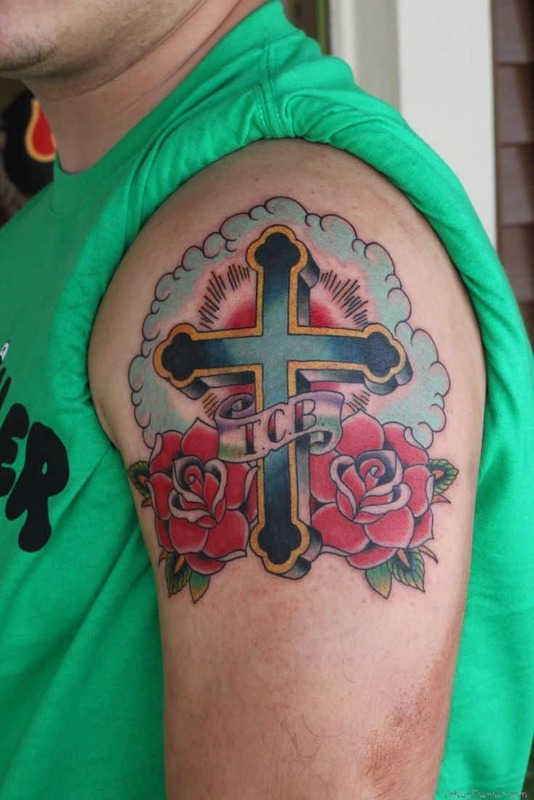 Among the colorful cross designs for tattoos, this sketch portrays the beauty of the rose, whether to show love or sacrifice, placed at both sides of the cross lined with golden curvy borders, beaming and appearing both mighty and powerful. 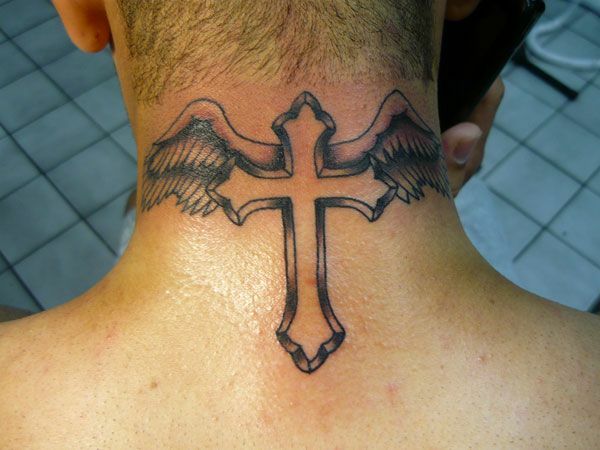 One of the perfect small cross tattoos for men is the winged cross in its miniature form, illustrated onto the back of the neck. A cross with thick borders both pointed and curved, with small angel wings spread far and wide for a welcoming look. 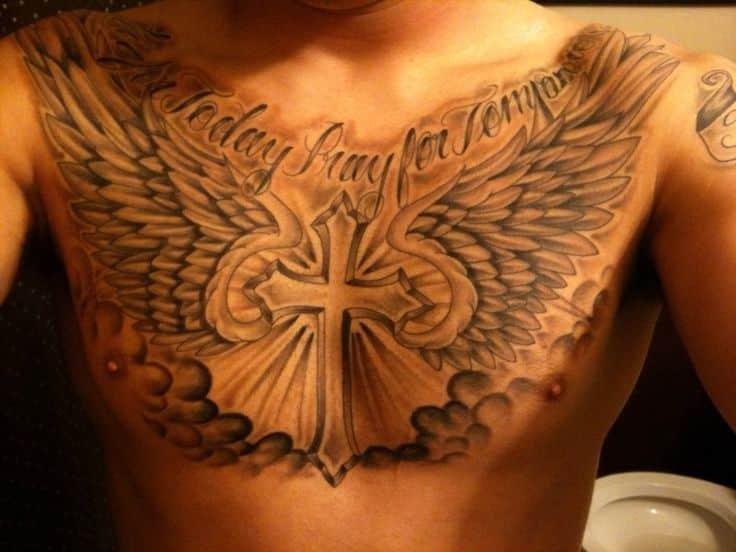 One style of men’s cross tattoo that leaves a remarkable impact and lasting impression, the cross shines through with a bright and divine light, intensified with tremendous wings that reach the clouds and skies, with a quote engraved on top to give it a personalized touch. 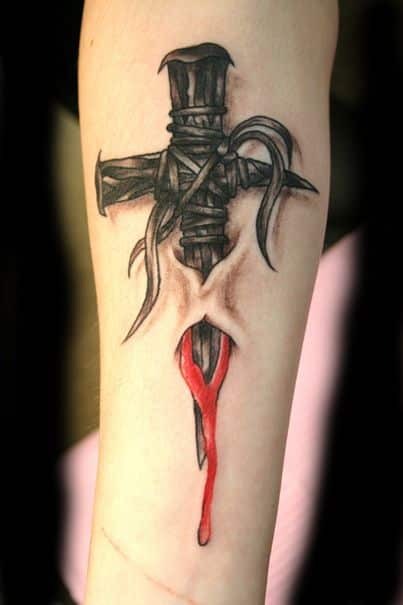 Another unique form of men cross tattoos, this sword type masterpiece seeks admiration with the thought put into it. This cross is actually two lengthy sharp-edged nails tied together and tucked into the skin, squeezing out drips of blood and tormenting pain. 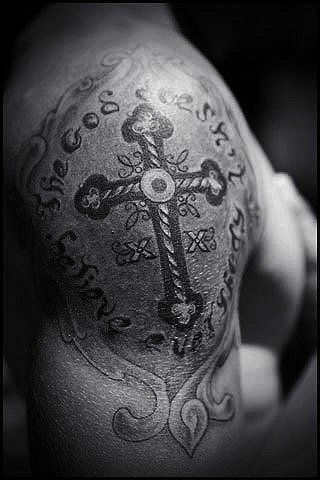 A tattoo emblazoned with rich texture, the cross is the center of attraction which seem like ropes being held together, accentuated with graphics and thin lines, a quote surrounding it, altogether placed inside a frame with finely outlined and stroked edges. 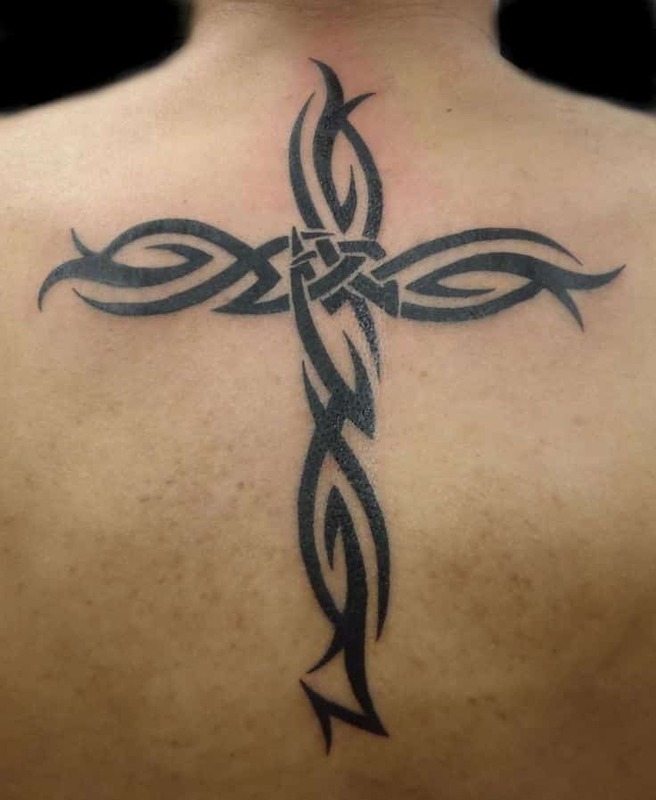 A tribal cross combines a classic theme along with modern styles with plain black curvy lines that are destined to flow freely, then interlaced together towards forming the tips, sides, and thorns, finally resulting to an outstanding work of art. A very symbolic work of art, truly a masterpiece depicting Christ on the cross, showing the snake, angels, death, and suffering. 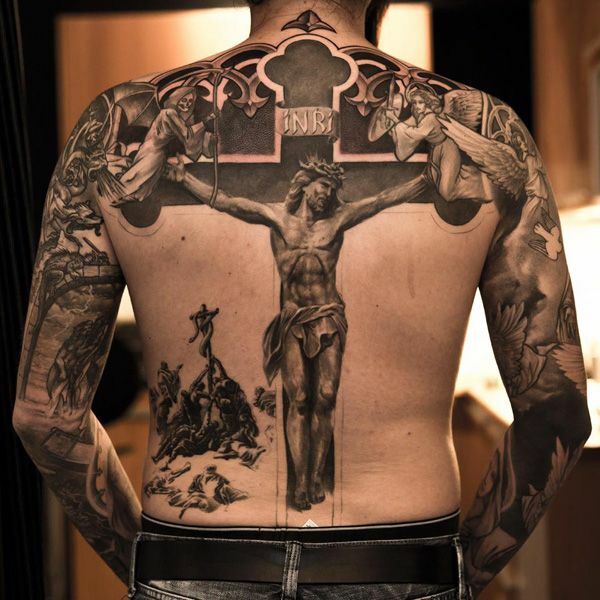 One can feel the heavens looking down upon earth in this beautiful representation of the cross from tattoo that covers the entirety of the arms, shoulders and back.